Put marshmallows and butter in large microwave-safe bowl. Microwave on high power for 2 minutes. Stir and microwave 1 additional minute. Remove from microwave and stir in green food coloring. Pour Kix™ cereal into a large bowl. Pour marshmallow mixture over Kix™ and stir well. Let cool for 3-5 minutes. After mixture has cooled slightly but is still moldable, spray hands generously with cooking spray (otherwise you'll get VERY sticky!). Scoop out 3/4 cup of the mixture and shape into a firm ball. Place on wax paper to harden. Repeat with remaining Kix™ mixture and let cereal balls harden (about 30 minutes). 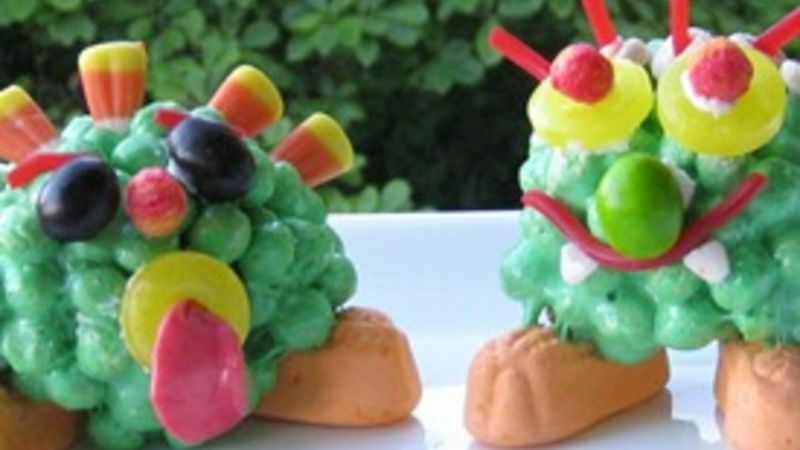 Add 2 circus peanut candies on the bottom of each for feet. Place assorted candies on the table, give each person a small bowl of vanilla icing to use as glue and let everyone create his/her own goblin! The little spooks and ghouls are coming out to play this month and it's time to have some fun in the kitchen! There are so many great Halloween treat recipes out there but there aren't very many that you can make with small children. Also, many of the Halloween treats were a little too spooky for my toddler. So, we whipped up these Green Goblins to make as a family and it was fun for all ages! In fact, my husband got so into it that in addition to decorating his goblin, he made himself a candy tooth! Not only is this an easy and tasty family activity, it's a GREAT way to clean out your pantry! We all know you have little bags of leftover snacks & candy in the corners of your pantry...you don't? Well, we certainly did and it was great fun to use them up to create these ghoulish Goblins! Grab your favorite candies and pantry ingredients and let everyone play Dr. Frankenstein and create his/her own monster! We had a ghoulishly good time!